To a C12 nave, an aisle was added about 1200, which was later removed, leaving the blocked arcade. 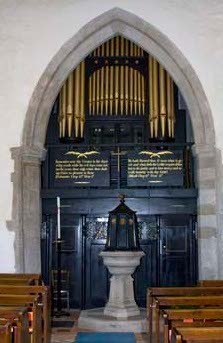 The tower and chancel are C13 and among the fittings is a C18 wooden font. Udimore lies on a narrow ridge between the rivers Brede and Tillingham. The church is only 80 yards from the parish boundary (Horsfield I p512), close to the site of Court Lodge, the old manor, which in 1912 was removed to Groombridge, Kent (VCH 9 p172). Though a church is listed in Domesday Book (9, 104), no part of the present one is older than the C12 nave. All but the top one foot of the north wall and the eastern of two blocked round-headed doorways with plain abaci are of this date. Other openings are mostly later, though there are four arched ones, one of which may be a C12 window. Around 1200 a south aisle was added, but only the blocked arcade remains. Though it has three arches, the western one differs from the other two. It has square responds and a slightly chamfered and pointed head with stops. The heads of the other two are similar but though square, their responds have slender filleted angle-shafts, either side of a rounded demi-shaft, which is thicker on the west respond. In the middle is a round pier with a stiff-leaf capital. Despite the differences, the date of all three arches is much the same, for as well as the similar heads, the stops on a damaged piscina in the east respond resemble those on the western arch. It is hard to explain the two differing sections, unless the initial intention was to have a short aisle, which was extended to the west end of the nave during building. Still in the early C13, the chancel was built, slightly wider than the nave. 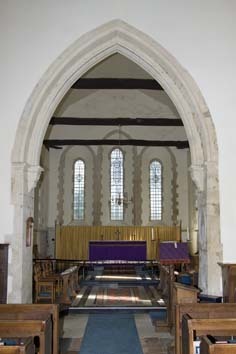 The date is shown by the chancel arch, which has a head of two orders. The inner hollow-chamfered one rests on corbels with dogtooth mouldings that are attached to square responds on which the chamfers and stops recall those of the arcade. 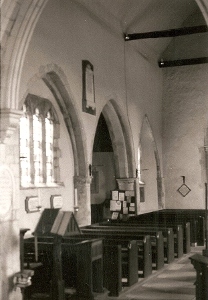 The chancel has a plain pointed doorway and lancets. The three stepped east ones have concentric rere-arches, another early C13 motif. The side ones have scoinsons with a string-course linking the sills. The south west one is divided by a transom at sill-level with a lowside beneath, now blocked. The roof is obscured by plaster, but the rough tiebeams and wallplates here and in the nave look original, though possibly altered. 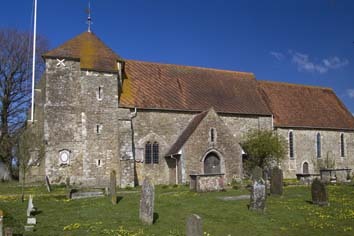 The tower is slightly lower than the nave roof and dates from c1230, on the evidence of its lancets and arch, which has a double-chamfered head and semi-octagonal responds, the north one of alternating light and dark stones. The south respond leans noticeably, which may explain the later brick west buttress, concealing the doorway. The pyramid spire extends over the prominent stair-turret to the south. Though the spire is now tiled, the form has not changed since both Sharpe Collection drawings (1797 and 1807) so it may be original. It is so unusual that it seems likely that it was not meant as a permanency and that the tower could have been intended to be higher. Possibly the evident structural problems put a stop to this. The C15 moulded arch of the south porch, which is otherwise C19, is said to come from the tower (Langdon p220) and in the blocking of the arcade are renewed C15 windows, which probably come from the vanished aisle. The eastern one is shown with two lights in the Burrell Collection drawing (1785), but now has three. Other post-Reformation changes on the north side of the nave included the blocked arched openings and second doorway which were probably for galleries. When the aisle was removed (it was already missing at the time of the Burrell drawing, but nothing more precise is known), a smaller porch was placed in the position of the present one. The same drawing shows a small round-headed opening above that may be the one set in the present porch. Its date is uncertain and it does not look like an original window, even had the walling survived. In the lower stage of the tower a square-headed window is C17 at the earliest and three north windows were inserted in 1806 (ibid). There is no earlier view of this wall, which was probably heightened in 1797, the date in the render. If so, the roof would have been taken off, but the old timbers were put back. The date is plausible, for a comparison of the Sharpe drawings shows other repairs in the ten years between them, including the unblocking of a chancel lancet. In 1896 the church was described as dilapidated (1 p10) and in the next year internal restoration started under the auspices of the impressively named Clergy and Artists Association for the Improvement of Art in Churches (BN 74 (29 April 1898) p xv). The architect was A H Skipworth (B 92 p515), who also designed new fittings (see below). Work went on for some years, for in 1903 the nave roof and most windows had not yet been restored (CDG 110 p26). M J Lansdell, who replaced Skipworth (1 p11), restored the tower and inserted big north lancets in the nave. He may have designed the present porch, covering the middle bay of the nave and opening into it. The result is one of the more sympathetic restorations in Sussex. Aumbry: (North chancel) Square-headed and probably C13. Carved stone: (Porch) A shaft decorated with a spiral pattern was most recently recorded in BE (p616). It may have belonged to a C12 pillar-piscina but is no longer to be found. 1. C18 wooden baluster and tiny bowl, plastered to conceal the material as wooden fonts were not permitted. 2. Plain round bowl of 1898 (BN 74 ibid), probably by Skipworth. Glass: 1. (South nave window) Fragments of C14 or C15 decorative glass, probably that noticed by Sir Stephen Glynne in 1826 (SNQ 17 (Nov 1968) p41). 2. (Above south porch) W Warrington, Leeds c1905 (www.stainedglassrecords.org retrieved on 31/3/2014)). 3. Engraved glass by H Turner, 1967 (BE(E) p642). 1. (North nave) Sarah (d1822) and William (d1830) Woodhams by J Smith of Rye (Roscoe p1151). 2. (North nave) William Woodhams (d1826) by J Smith (ibid). 3. (South nave) James Smith (c1832?) by J E Hinchliffe (Roscoe p620). 4. (North chancel) Thomas Langford (1845?) by J Smith (ibid p1152). 1. 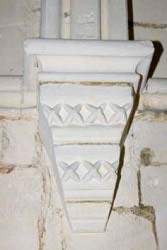 (East respond of south arcade) Damaged of c1200, chamfered with stops (see above). 2. (By font) C12 spiral fluted shaft, which probably comes from a pillar-piscina. 3. (South chancel) Large and segment-headed, probably C13. Pulpit: By Skipworth (B 92 ibid). 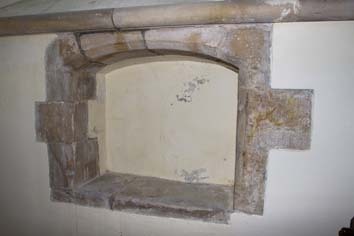 Recess: (East wall of chancel, behind altar) Square with a wooden lintel. Probably C13 and intended for relics. 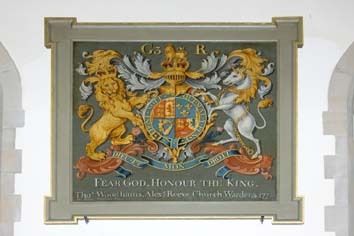 Royal Arms: George III, painted and dated 1772.